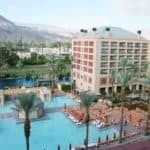 On top of lodging and Park tickets, food can be a very big cost factor when planning a Disney vacation. Everyone has to eat and when you’re away from home you need to eat what’s available. 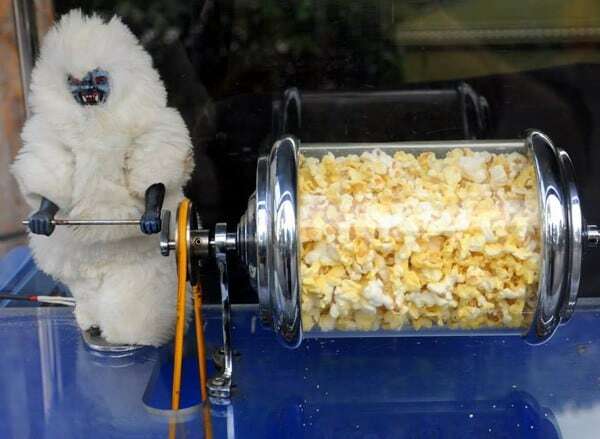 Yes, you can pack snacks in to the Parks. but when it comes to long-term sustenance, nothing beats a good hearty meal. Fortunately Disneyland has plenty of options that will fill you up! And if you share, these choices can also be very economical. What are the best meals for sharing at Disneyland? 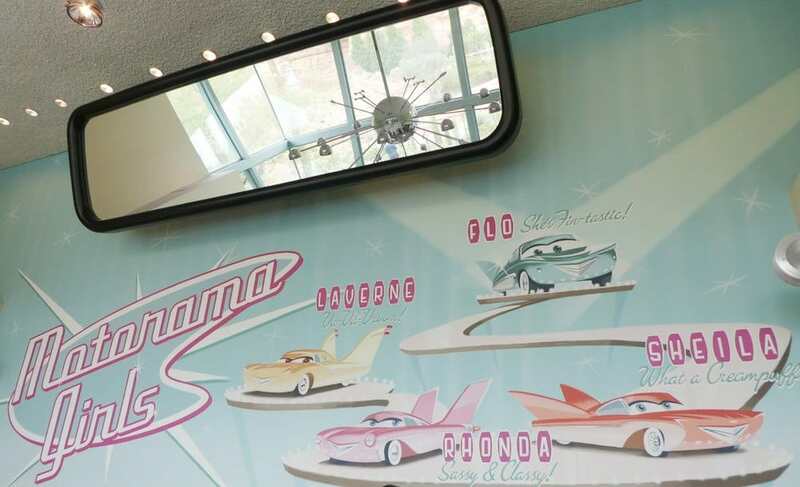 Read on for the Disneyland food tips – hope you’re hungry! Disneyland meal platters are often very large and might be difficult to finish on your own. Unlikely that you’ll want to walk around the Park with a “to-go” box of your leftovers either. Kids meals are cute (Mickey shaped plates!) but for the price, you don’t always get the largest portions. And often the offerings for kids are nuggets and fries, which you can get anywhere. Why not try something new? Not only is sharing a more budget-friendly idea, it’s also great to try more than one dish. As a family of six, we often purchase two platters and a side (like a salad or appetizer) to share between us when we’re at Disneyland. This way we can all try a little bit of everything and it’s more cost-effective. 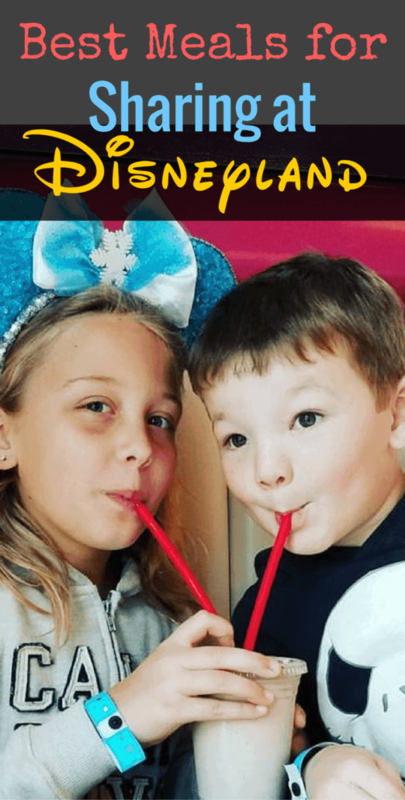 If you plan to split a meal at Disneyland because you’d like to eat healthier, check out this post with ideas on How to Eat Healthfully at Disneyland (and Still Treat Yourself!). In the mood for Mexican? Cocina Cucamonga Mexican Grill has traditional-style platters big enough for sharing. A big platter shared between two or more is usually your best bet when it comes to Disneyland food prices and large portion-sizes. If there are more than two in your group, you might want to order more than one platter or an additional side dish to share between you. 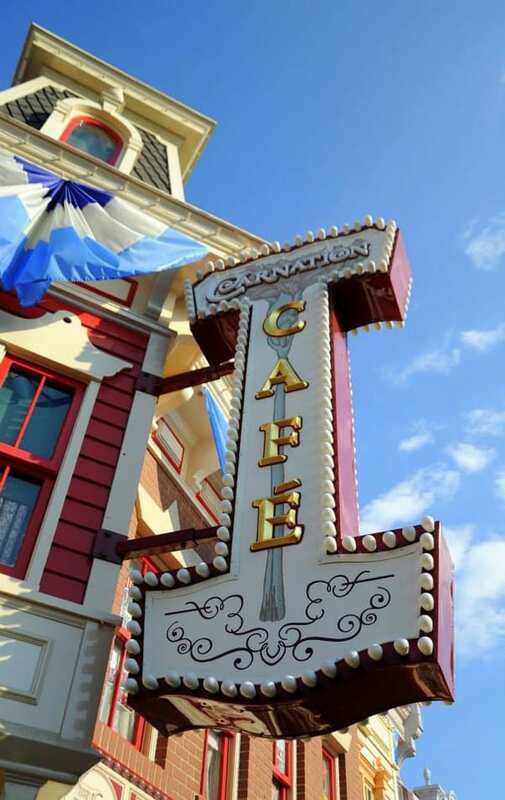 The Carnation Cafe serves big breakfasts like Country-Fried Steak and Eggs and a Ham and Cheese Omelet that are perfect for two to share in the morning. 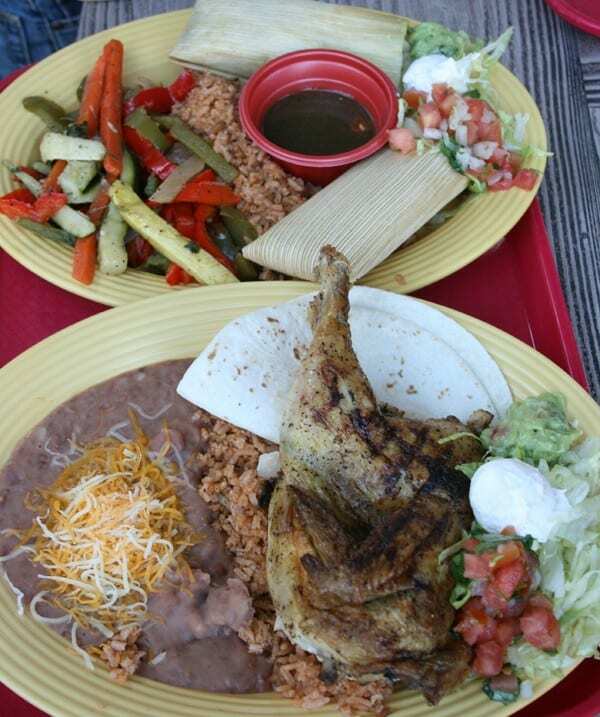 Cocina Cucamonga Mexican Grill is a family favorite for us, with heaping portions of grilled meats, tortillas, tamales, rice and beans. You can also opt in for Mexican at Rancho Del Zocalo Restaurant where you can order enchiladas and tacos. Flo’s V8 Cafe is known for their homey cooking and large platters like BBQ Pork Ribs and Rotisserie Chicken. French Market Restaurant is another family favorite. We love to order the Cajun-Style Meatloaf and French Market Chicken and share it between us all. Choose a few skewer platters from Paradise Garden Grill to split. Each plate also comes with rice pilaf, cucumber salad and pita bread. The River Belle Terrace now serves platters large enough for splitting, including a Sausage Link Combo and Pulled Pork Sandwich. The beautiful and bountiful platters of pasta from Wine Country Trattoria are easy to divide and you could always round out the meal with an Italian Insalata appetizer. 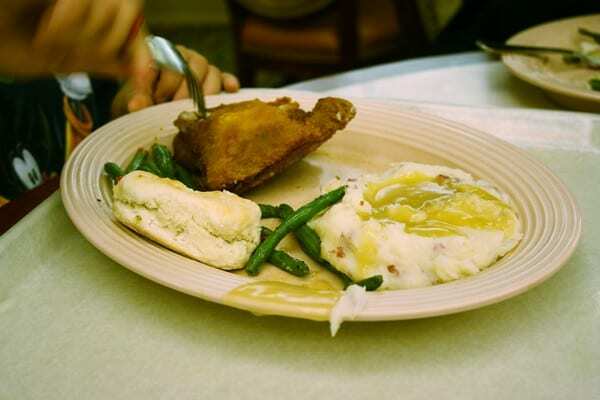 Plaza Inn is a perfect dinner spot with their enormous platters of fried chicken, potatoes, buttermilk biscuit and veggies. This is one third of a portion at Plaza Inn. 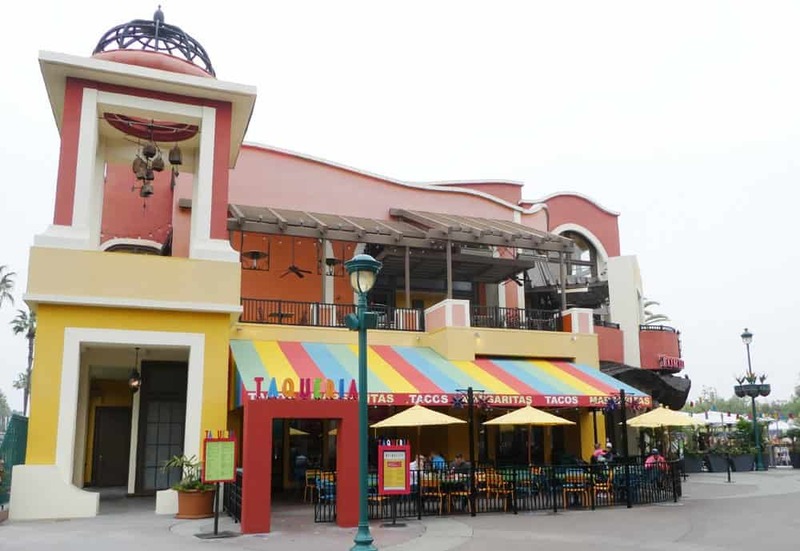 Head into Downtown Disney District for more platter-sharing options, like the Signature Barbacoa Nachos or Fajita de Tres at Tortilla Jo’s. Or a large plate of pasta, like the Penne Pomodoro with Italian Sausage at La Brea Bakery Cafe. The Monte Cristo at Cafe Orleans in New Orleans Square can be on the heavy side for one person to consume (turkey, ham, Swiss that’s been lightly battered, fried, drizzled with powdered sugar and topped with berry preserve). Don’t forget the pomme frites! For a large variety of salads, Rainforest Cafe in Downtown Disney District has about 10 large salads topped with a good mix of fruit, chicken or extra veggies. La Brea Bakery Cafe in Downtown Disney also offers large salads topped with seafood offerings like blackened mahi-mahi or grilled salmon. My husband and I split a Roasted Turkey Sandwich from the Carnation Cafe for dinner last year. Along with fresh fruit (option instead of fries), it was a filling and delicious meal. 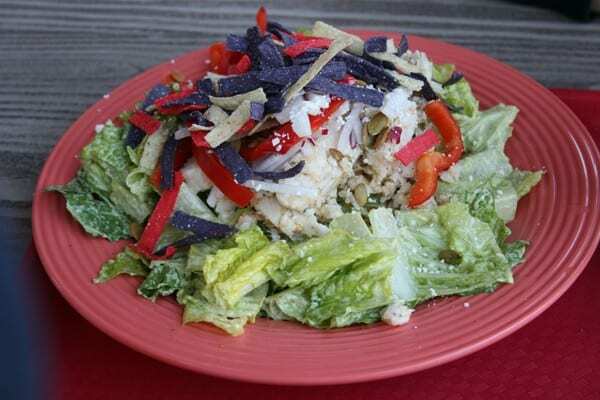 The salad at Cocina Cucamonga Mexican Grill (shown below) is big enough for two to enjoy. Step outside the Parks into the Downtown Disney District at Earl of Sandwich for large sized sandwiches that are hearty enough to share. We’ve purchased several breakfast sandwiches here as well and cut them into quarters so that everyone have a few bites from each different variety. Breakfast sandwiches are under $3.50 and hot lunch sandwiches are around $6.99, so the prices are really right. The prices at Fiddler, Fifer & Practical Cafe are a little higher but they also come with fresh fruit. Plates are a few dollars more at Jolly Holiday Bakery Cafe but the sandwiches come with popular house chips. And it’s all about the seafood at the Harbour Galley. Stop by for a Lobster Roll sandwich that’s sure to float your boat. Sometimes you just need a nibble and these snacks are great for sharing. Everyone gets a few bites and you’re good until the next big meal. Grab a few skewers from Bengal Barbecue in Adventureland. Each skewer is under $4.50 so the price is right to order a few and share between you. 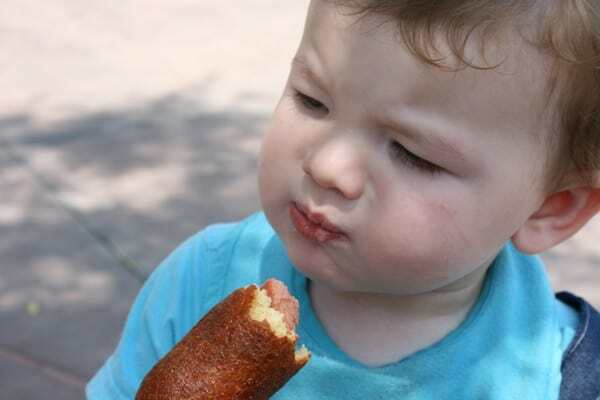 The corn dogs from either Corn Dog Castle or the Little Red Wagon Corn Dog Cart are over sized and nice for sharing between two (they come with either sliced apples or a bag of chips). 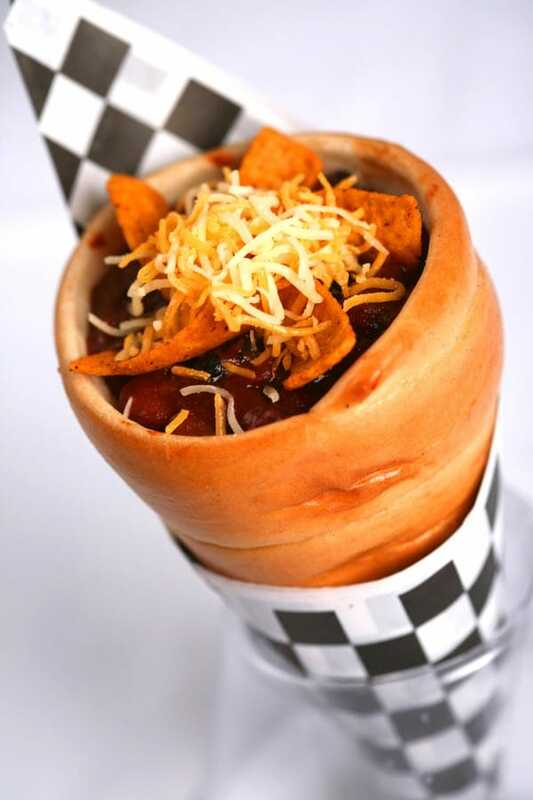 Chili Cone Queso from the Cozy Cone Motel is also a good size for two to share. Of course there is always the behemoth turkey leg sold at Edelweiss Snacks that is large enough for an army. You can also pack in your own snacks into the Disneyland Parks, one of many top tips for saving money on food! Order a whole pizza from Boardwalk Pizza and Pasta or Redd Rockett’s Pizza Port. You can get pepperoni, veggie or plain cheese amd round out the meal with a salad to split. 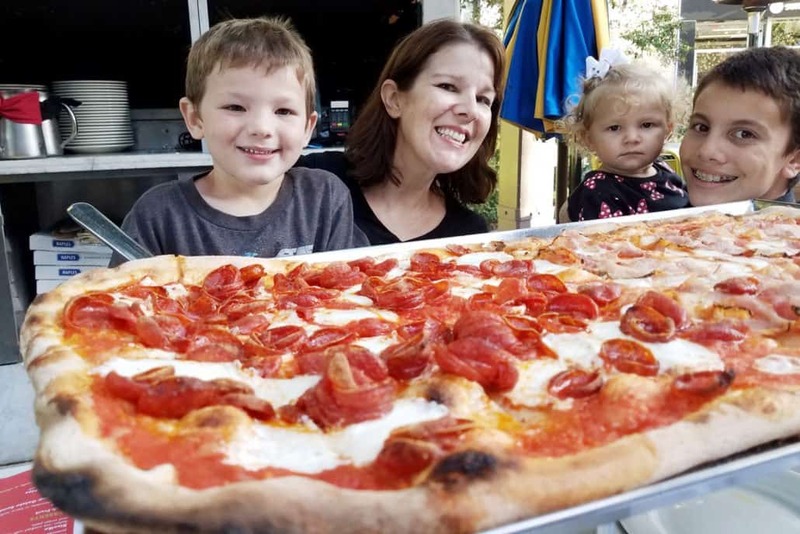 My family and I ordered the 1/2 meter family-sized pizza at Naples Ristorante e Pizzeria in Downtown Disney District. It was enough to feed six people (and there were a few slices left we just couldn’t finish!) For less than $50, this was a decent price to feed us all. They let us go 50/50 on the toppings to please everyone in the family. Save Even MORE Money at Disneyland! I’m usually way too full after my meal to indulge in dessert so I wait and get a treat later when I can more fully enjoy it! The Golden Horseshoe is a favorite sweet spot because you can share one of the big sundaes and watch a comedy show. The Jolly Holiday Bakery Cafe has a large variety of desserts that you can divide between your group including cupcakes. 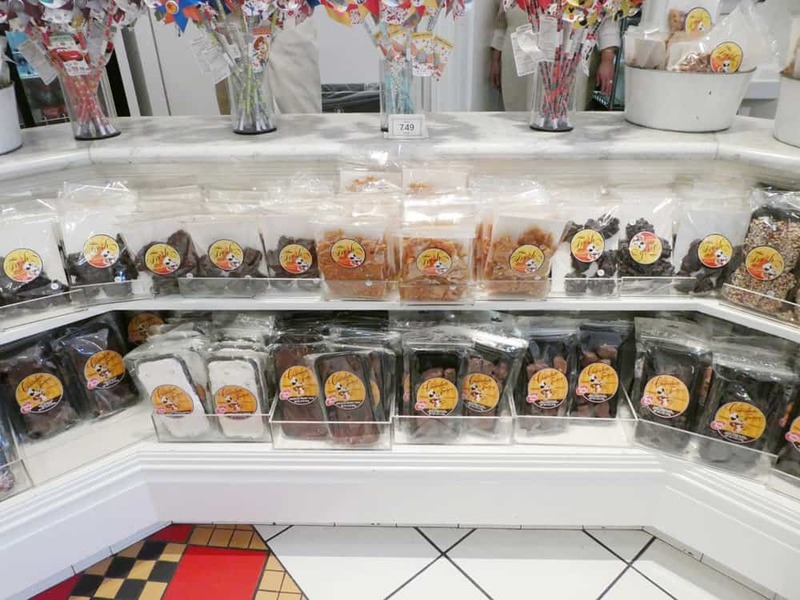 We usually indulge in homemade fudge or toffee from Main Street U.S.A. to share between us! If ordering at a quick-service counter restaurant, request a second or third plate up front. Grab yourself plenty of flatware and divvy the plates up at your seat. If ordering at a full-service restaurant, note to the wait staff that you’ll be sharing the dish. They may even be able to divide the dish in the kitchen and serve it to you on two plates so you don’t have to do that yourself. Some establishments have sharing restrictions. Buffet restaurants, Prix fix meals and Character meals are no-sharing allowed zones. Each person in your group will be charged up front for entry. Certain restaurants (like Blue Bayou) charge a “plate splitting” fee if you order a platter to be shared. Keep that in mind when working out your food budget and determine if the fee is worth it or if you should just purchase an additional meal. The exception for sharing is with children 2 years old and under. You are welcome to share your food with them from your plate or fix them their own plate from a buffet.